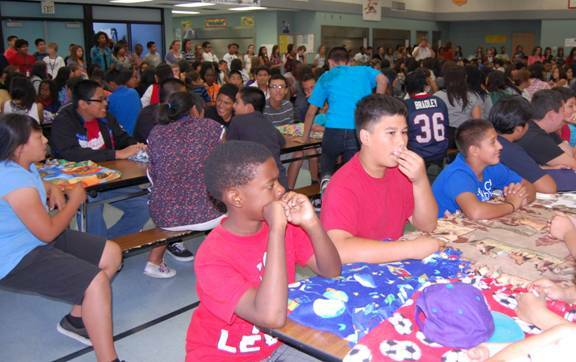 PALMDALE – More than 300 students from Summerwind School came together Friday to make blankets for families of the Marines. 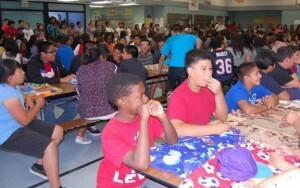 “I want my students to basically see what it’s like to give back,” said 6th Grade Teacher Lisa Perry. 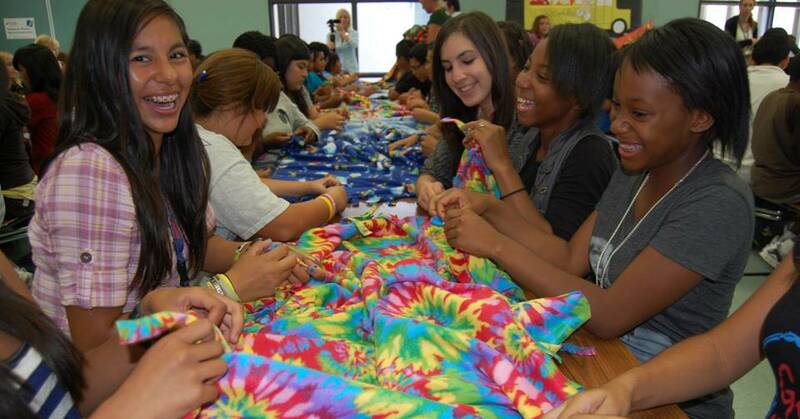 Perry put the students to work as part of Project Linus, a non-profit organization comprised of thousands of volunteers who provide comfort to children who are seriously ill, traumatized, or otherwise in need through the gifts of new, handmade blankets. 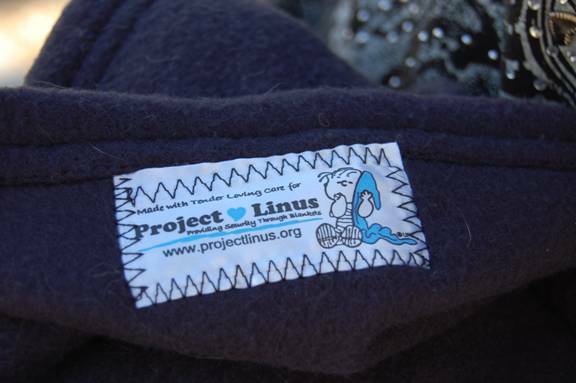 Named after the blanket-toting character in the Peanuts comic strip, Project Linus distributes handmade blankets to children who are victims of fire, children whose parents are deployed, and children who are in the hospital. Firemen carry the blankets in their trucks, police keep them in the trunks of their cars, and hospitals keep them on hand for children facing surgery and other serious health issues. Perry connected with the organization when her son was five years old and received a Project Linus blanket as he was facing emergency surgery. 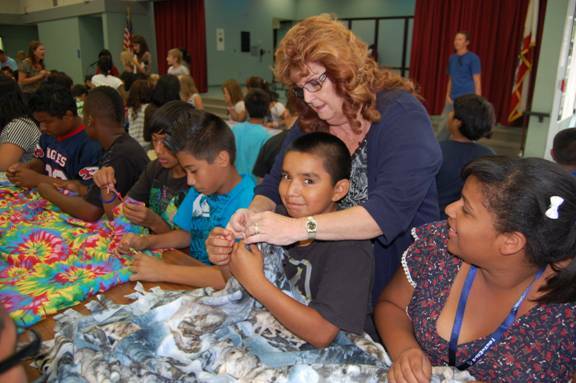 Perry connected her students at Summerwind with Project Linus after the organization received a call for more blankets from the Twentynine Palms Marine Base. “They’ve had so much deployment lately that they’ve actually depleted their resources of blankets,” said Perry. “They contacted us and asked us if we could make blankets for the children of the deployed parents that are leaving for Afghanistan and other hot spots because they had run out,” continued Barbara Yamamoto of Project Linus. Using more than $500 worth of materials donated from Lockheed Martin and the Foresters, several volunteer “Blanketeers” cut the materials down to size and then cut strips along the edges, Yamamoto said. Then students at Summerwind tied the blanket strips together Friday. “We are relieved that these young people are so nimble,” Yamamoto said. Friday’s student workshop yielded 65 new handmade blankets. 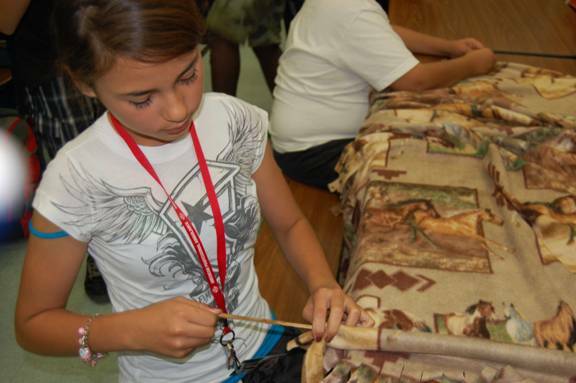 Yamamoto will then sew tags (Made with tender loving care for Project Linus) onto the blankets and deliver them to the Twentynine Palms Marine Base so that the blankets can provide comfort and security to children whose parents are deployed. Since its inception in 1995, Project Linus has distributed more than three million blankets to children in need, according to the organization’s website. Project Linus National Headquarters is located in Bloomington, Illinois and has local chapters in all 50 states. Blankets are collected locally and distributed to children in hospitals, shelters, social service agencies, or anywhere that a child might be in need of a big hug. For more photos from this event, visit our facebook page here. 1 comment for "Students work together for Project Linus"